For me, the hardest part of leaving home was not saying goodbye to my parents, or saying goodbye to friends. The hardest part of leaving home was saying goodbye to my dogs. My dogs are apart of my family and me. These girls have my whole heart. They are always following me around the house and keeping me company. Now that I am up here at Northern, I feel a bit lonely knowing that they aren’t sleeping on the floor next to me, or that they won’t be there wagging their tails when I walk into my room. I constantly wonder what they think happened to me. Although, I can’t have any real communication with my dogs, I still have my mom put the phone up to their ear, “Hi baby girls, I miss you and love you so much!” Being homesick is one thing, but missing your dogs is another. I can’t wait to see them again, even though I know there will be another goodbye to come. Love comes with a high price, but having my dogs is worth it all. So the other day I was watching My Dog Skipp and I just burst out in tears at the end. 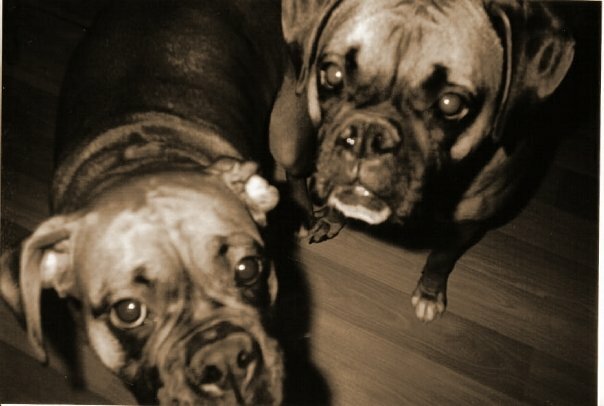 Ive seen My Dog Skipp a million times but It was just the mere fact I missed my dogs soo much! I just really miss the companionship of them and the way they are waiting for me when ever I came home and how excited they would get. I just got some film developed and I had a picture of my lab Rusty in it. It just made me miss him even more! So I know the feeling of missing your dogs! Wow, first of all those dogs are very very gorgeous. I totally know how you feel. I had a golden retriever mixed with a yellow lab and it was the nicest dog ever. We had to put her down awhile ago, without her my home is lonely. I loved this post. I have a dog of my own that I had to say goodbye to and it was so hard. It’s difficult because you can’t explain to them where you’re going, why you’re going, and when you’ll be back. I love their names too!! How cute. I can definitely relate as well. I have a dachshund who slept with me every night. Not having him around every day definitely feels weird to me, it feels like I am missing a part of me with him being so far away from me! All the comments before me where talking about how much everyone loves dog, which is fine, but I have a cat who I ardor. He sleeps with me every night and when I go out of town he just becomes besides himself. He meows all night looking for me bits my mom a lot more. I know I’m not much when he comes in at night he gets a can of sticky cat food and I’ll wait up for him until he is done so we can go to bed together. So just keep in mind that there are more pets then dogs out there.